The Economist is launching a new wave of provocative press ads to try and spark a debate among commuters and boost its circulation. The new campaign launches on Monday and forms part of the magazine's 'Where do you Stand?' drive, which includes press ads on London Underground. 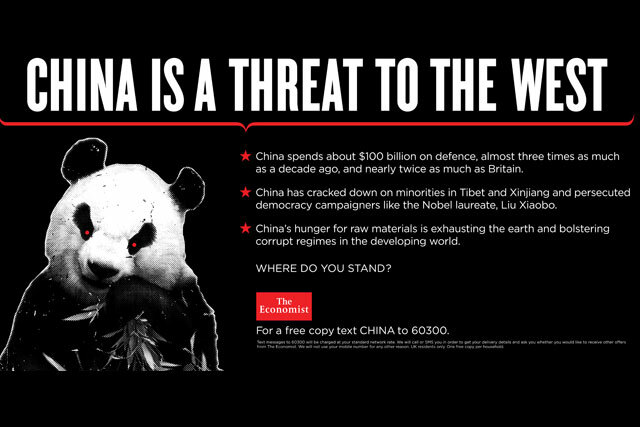 Created by Abbott Mead Vickers BBDO, the ads will encourage commuters to debate whether or not Britain should slash immigration, give up trying to be a global power, and ask if China is a threat or friend to the West. Two posters, located side-by-side, will display both sides of each argument. The ads aim to attract new readers, challenging people's misconceptions about the magazine being only for high-powered business people. Posters also offer potential readers a free copy of the weekly magazine through a text code. The ads were written by The Economist. The art director was Colin Jones, who worked alongside creative directors Mike Hannett and Dave Buchanan. Media planning and buying was handled by PHD. From 20 June, The Economist will also distribute specially created free sample issues, containing articles from past issues designed to show the breadth of Economist content. It includes pieces on the Rolling Stones as a business partnership, how to improve your reputation, and the quality of death. According to the Audit Bureau of Circulations (ABCs), the Economist registered a circulation of 210,204 a week in the period July to December 2010.